This topic contains 10 replies, has 5 voices, and was last updated by topgun2 2 months ago. 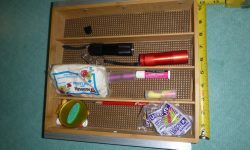 While I have a “junk” drawer, there are items that I wanted to store in the nightstand but would get lost if just tossed into that large drawer. So, I took measurements of the existing nightstand drawer and went on a search for a “tray” that I could place on the top of the sides. I did go to various “office supply” stores looking for a tray that had “rails” already built in but I simply could not find what I was looking for and the only “tray” that I could find that was about the right size to fit between the sides of the existing drawer was available at Target. I cut two lengths of aluminum 1/2 inch angle and bolted these to the sides of the tray. It now rides nicely on top to the sides of the nightstand drawer and still allows easy access to the main area of the drawer below. 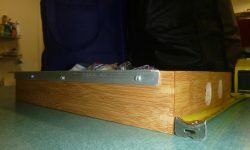 After a season of use, I did cut off part of the tray – about 2 inches – so as to allow easier access to the main drawer below. This shorter tray is also easier to remove from the drawer making the two “finger” holes that I drilled in the front of the tray redundant. That’s a great idea, Bill. I’ve been looking for a good solution for that drawer. All are welcome – glad you like it. I should have been a bit more clear about the part I cut off. Originally, the tray looked like a regular silverware tray with an additional storage area running perpendicular to the ones shown – like most of the silverware drawers available. That was the part that I cut off thus leaving the three shown in the photos. The only thing that I dislike about this mod is that the aluminum angle leaves a dark mark on the tops of the sides of the nightstand drawer. Obviously that could be remedied with a clear coat spray or reduced with the application of a bit of wax. Or, simply keep the drawer shut and do not worry about it. Maybe some felt pads on the angle would keep it from scuffing up either the top or inside of the drawer. LOVE this idea (that drawer is so deep it seems useless), and Chad needs projects to work on while waiting for the Ollie! Any idea what the dimensions are, or which tray you got from target? I agree that I would run felt on the top edges of the drawer to protect them and still allow a slide. I did mine this weekend. The insert I bought was 10″ x 14″, and like Bill, I decided to cut off the extra compartment. I paid extra for this one because they said that the bottom was bamboo and not MDF like the others. They lied, so don’t bother – get the cheapest one you can find. I also got a similar 10″ x 16″ tray to go in the bottom. It fits well with about an inch to spare front to back. Instead of attaching the angles, I had some adjustable shelf pegs like these in my shop, so I just measured and drilled inside the drawer for those. I put some thick felt furniture pads on both sides of the tray, so it fits snugly and hopefully won’t mar the drawer. As I recall, I paid right at $10 for the one at Target. 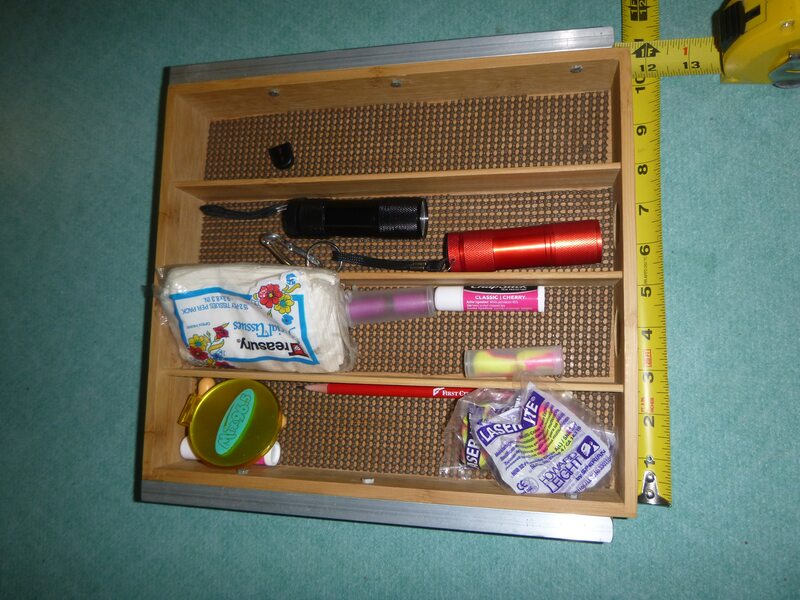 The critical measurement is the width – the tray obviously has to fit inside the nightstand drawer. As can be seen in the photo on my original post, the width of mine is right at 10 inches. Perhaps, depending on what is used to suspend the tray on the sides of the drawer, the width of the tray could be as much as 10 1/4 inches. Contrary to Overland’s tray, the one I bought at Target is constructed entirely out of Bamboo. But, frankly, I really didn’t care about the construction materials and would probably have preferred plastic from a cleaning perspective. 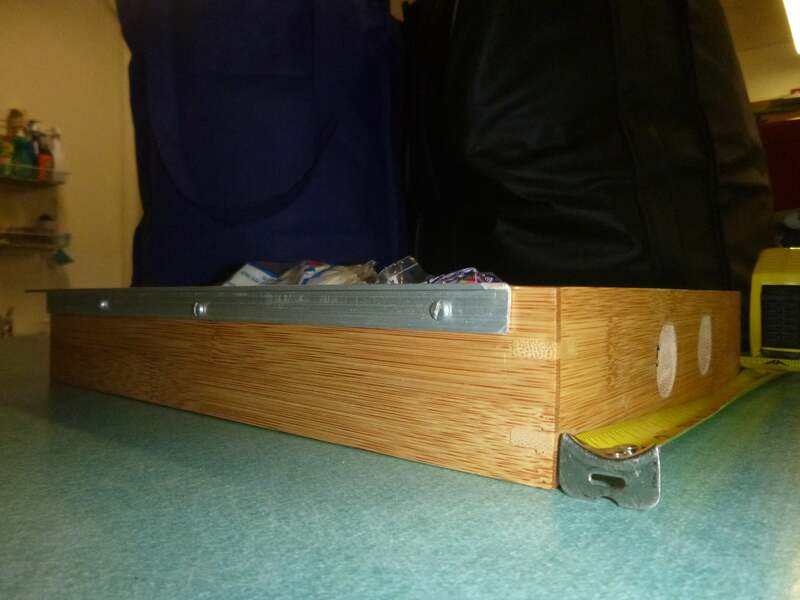 Again, as Overland says, I’d simply look for a tray with the proper width, and cheapest cost as long as it has enough structural stability to handle the kinds of things that you wish to store in it. Thanks! I found some dimensions of all the drawers, but your insight on actual fit is very helpful. I think Chad may try to construct this himself from scrap wood. He was thinking of just one divider down the middle (his/hers), and has some plastic pieces left over from something that may make great slides. It’ll give him a reason to play with all his shiny power tools. Regarding the bamboo silverware holder from Target, I bought one when we first picked up our trailer but it was only stapled together and quickly fell apart from, I assume, being bounced around while driving. I am glad that yours is working out for you, but I’d also like to know which brand you purchased. I think the one we bought was from Lipper International. I have no idea as to the brand name – sorry. However, take a close look at the picture of the drawer I purchased and you can see that the corners are not simply glued or nailed together. After two years on the road, there are no signs of the corners coming apart.